Tether recovery is a special technique in Super Smash Bros. Melee, Super Smash Bros. Brawl, and Super Smash Bros. for Nintendo 3DS / Wii U. In Super Smash Bros. Melee, only Link, Young Link and Samus could use it, using their grab commands. These included the Hookshot and the Grapple Beam. Zero Suit Samus was the first character to be confirmed to use this move in Super Smash Bros. Brawl. 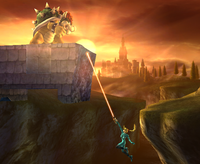 It allows the player to cling onto the stage, via a chain-like item. When used, a character will launch the aforementioned chain-like item to cling on to the stage. It will then retract, slowly bringing the player back up to the stage, bringing them back to safety. The tactic usually has a large range, and can reach out very far, but if it doesn't hit its target, the tactic won't work. ↑ (May 23, 2007). Link. Smash Bros. DOJO!!. Retrieved July 10, 2018. This page was last edited on March 14, 2019, at 15:07.